This is an easy and fun way to use leftover scraps to make an elegant and useful case for your eyeglasses. Actually, depending on how large you make your initial fabric panel, you can create other things like pillows, cases for smartphones and tablets, or – if you are really ambitious – a spectacular jacket. 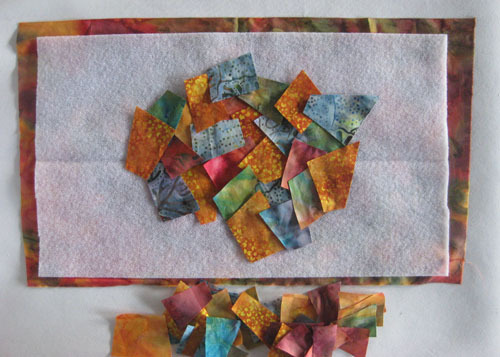 Step 1) Prep your fabric scraps. 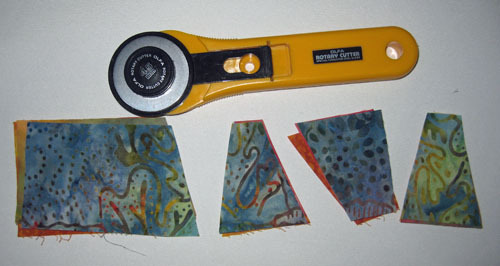 Cut your scraps into 1”- to 1-1/2”-wide strips. No need to measure – the more irregular the better! 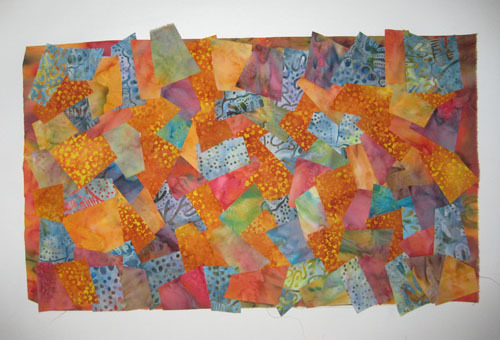 Cut the scrappy strips into squares or irregular triangles, trapezoids –whatever shape you like. I don’t use a ruler but you can if you want. Cut a piece of fabric to use as your background. For this project, if you are only making one eyeglass case, an 8” x 8” pieces works well. I made mine twice that size (8” x 16”) because I wanted to keep one for myself and give one to a friend. Cut a piece of fusible fleece to match the backing fabric. Place the fleece glue-side-up on top of the background fabric. Arrange your scraps on top of the fleece in a pleasing pattern and be sure to overlap them so the fleece doesn’t show through. Cover the entire fleece panel with scraps. 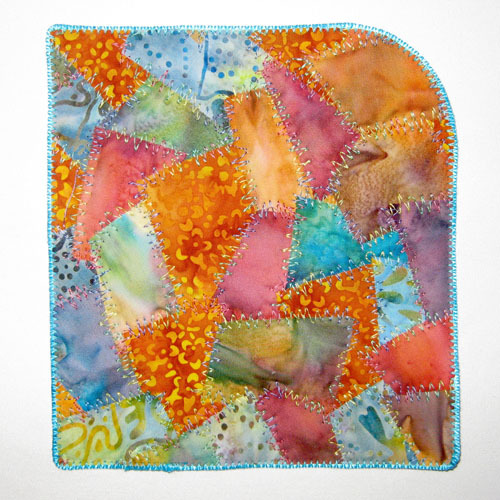 Take the layered piece to your ironing board and fuse all the scraps down onto the fusible fleece. 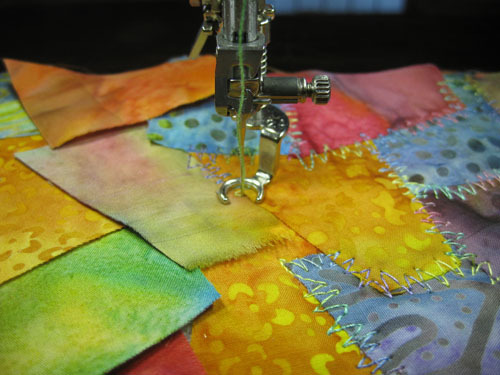 Because the scraps overlap, they won’t be perfectly glued, but the fusing will still help keep the scraps in place as you machine stitch over them. 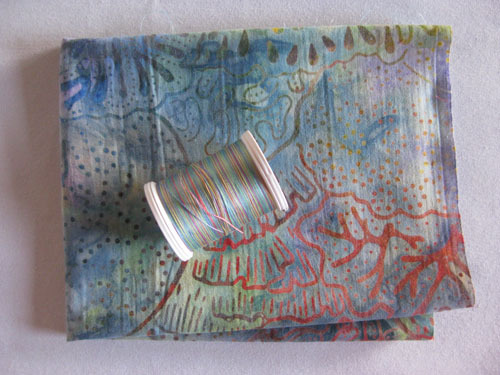 Select a variegated thread for the top (needle thread) and something you like (either matching or contrasting with the backing fabric) for the bobbin. Tip: If you are not comfortable doing free-motion stitching, you can use a simple zigzag stitch to cover all the edges. 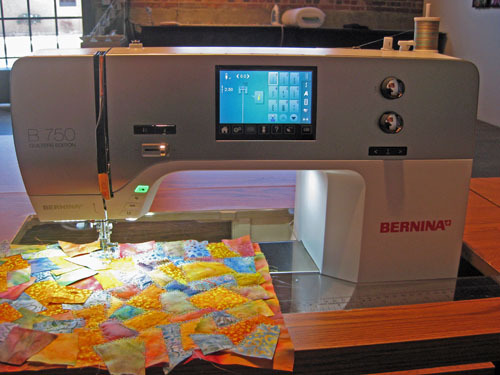 Adjust your stitch to the widest width available on your machine. 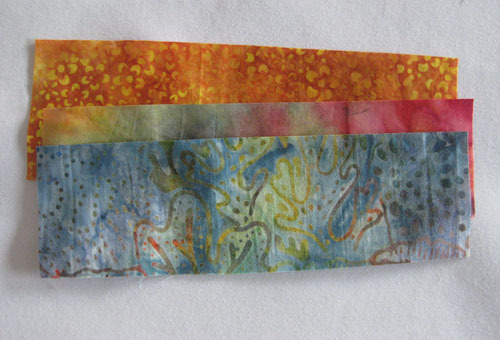 Once you have stitched over every edge, make a pattern for the eyeglass case. I used a file folder and draw a rectangle measuring 6” x 6-1/2” and used a coffee cup to trace an arc on one of the corners. Then I cut out the pattern and placed it on top of my fabric. Using a ruler or pattern weights to keep the pattern in place (you could use pattern weights), I used a rotary cutter to cut out the fabric. Cut a piece of rattail cord long enough to go around the edge of the fabric plus an extra 5”. 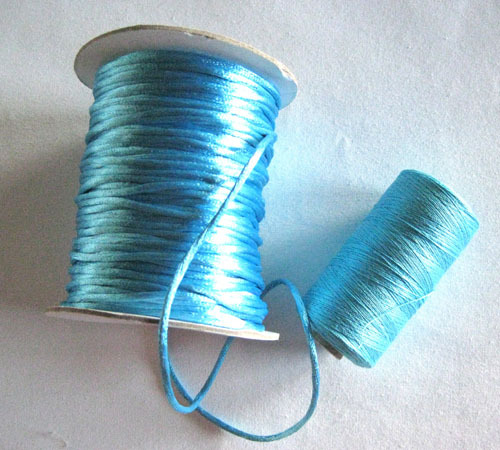 Thread your machine with a matching thread in the needle and on the bobbin. Pin one end of the cord at the lower edge of the quilted fabric piece. Using a wide zigzag stitch, attach the cord all the way around the edge. Tip: Click HERE to visit my website for a video demonstration of my rattail binding technique. To complete the case, fold it in half and use a zigzag stitch to sew around the bottom and side edges. Enjoy your new eyeglass case! 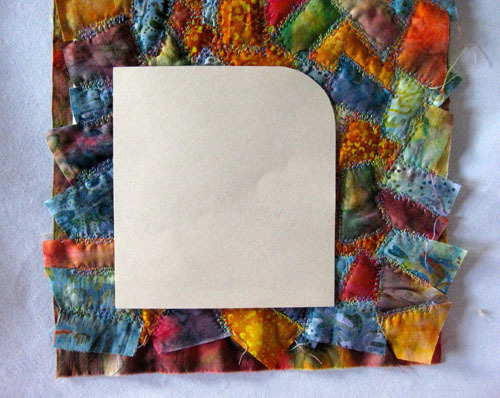 Variation – Echo-quilt the stitched scraps, spacing lines of stitching 1/8” to 1/4” apart. 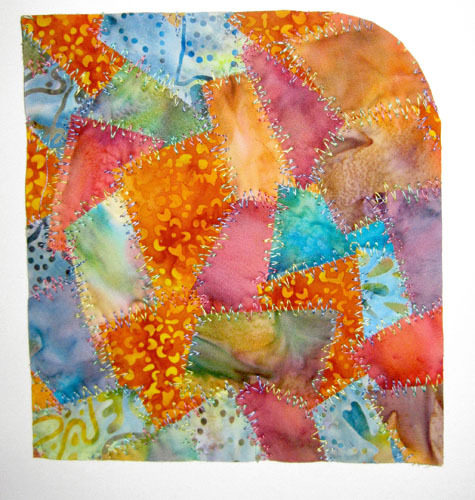 Next Next post: Hand Embroidery + Decorative Machine Stitches = Awesome Embellishment! love the technique! Can’t wait to try it!